Again, just under the wire! The small Charm Square diamond top is quilted. 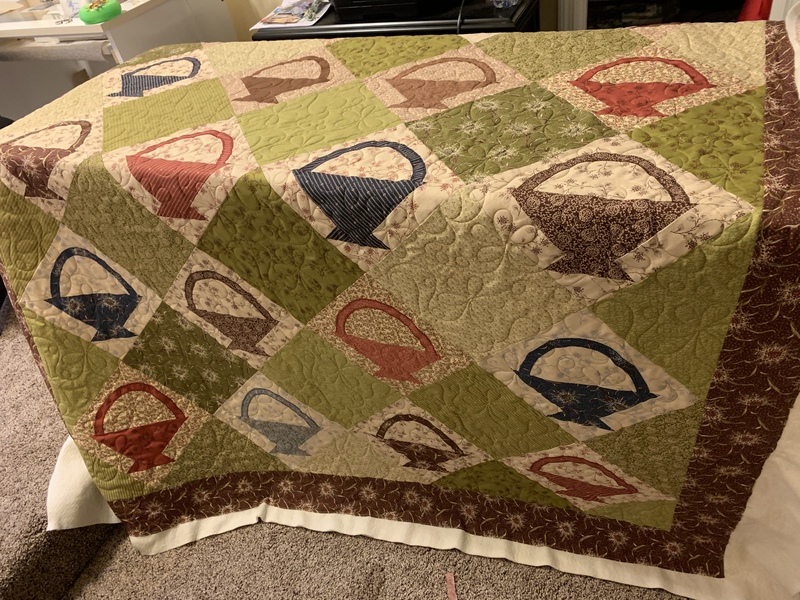 I can’t say I love this little one but at some point I ended up with a single Charm square pack and I’d wanted to see how I liked HSTs arranged in this layout so I was happy to get this one made and now quilted. 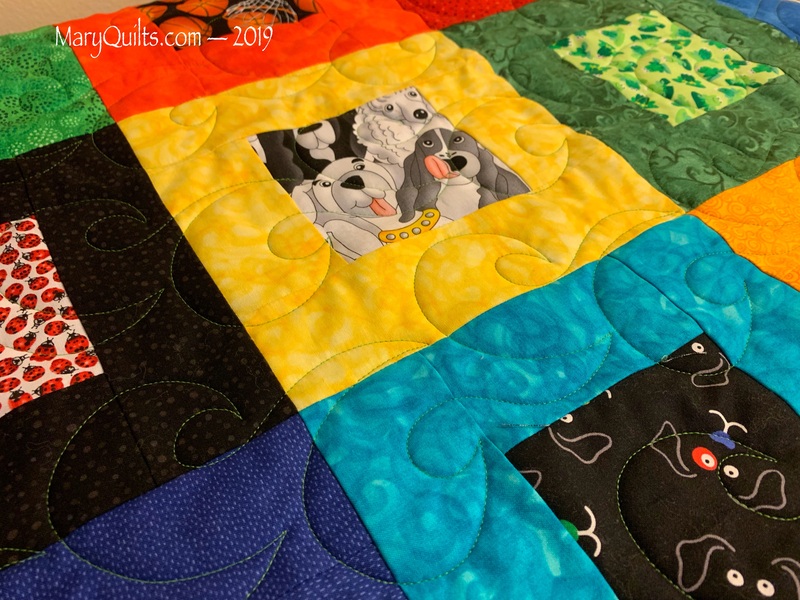 I pieced it as a part of our Precut Party – started in January but not fully assembled until February – it will be a nice little donation quilt. Pantograph is Wave. This marks everything off my to do list before my trip on Monday which is great because I have a genealogy conference I’m going to tomorrow and Sunday is for biking with Keith! I’ll have some binding to do when I get home! 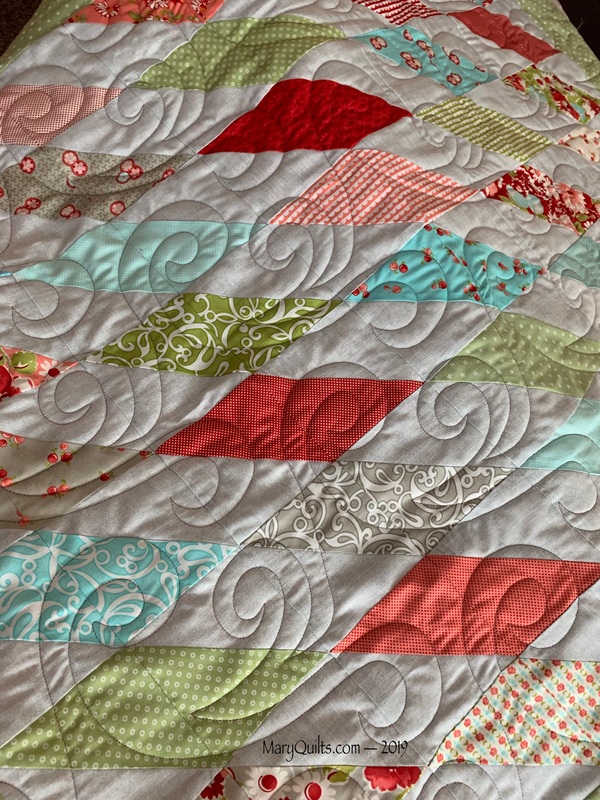 PS are you playing along with our HeartStrings Precut Party? I can’t wait to see what Stephanie pulls for April! I almost didn’t get this little Charm square top loaded on the longarm and quilted today but I did! Pantograph is Leap Frog. My goals this week weren’t all that challenging but I’m happy I met them all. The taxes were mailed to the accountant yesterday afternoon … I had some last minute research and calculations to make because I thought the information was in a report I was sending but luckily I realized it wasn’t before I mailed everything off. 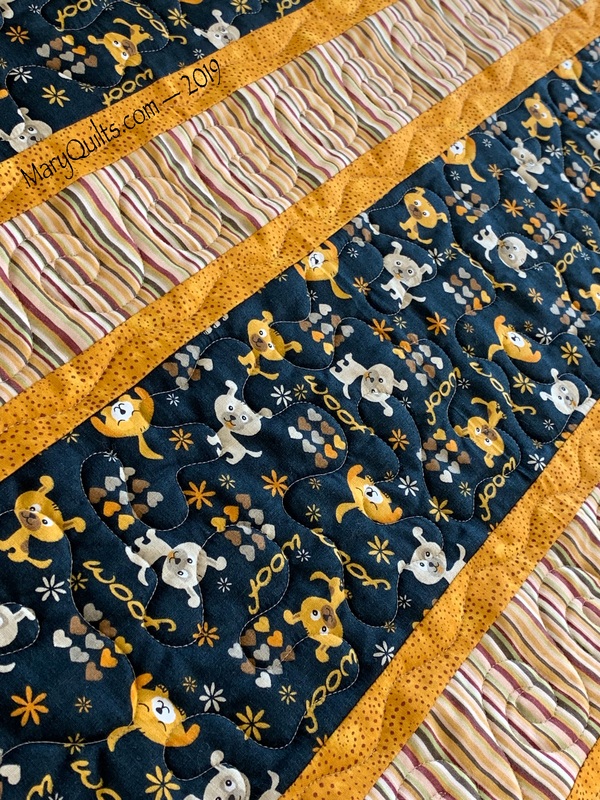 I’m so glad tax week is done for another year and I managed to convince myself to go in and load the little dog Strippie on the longarm and quilt it rather than sit in my chair and read all afternoon! I rarely do any plain meandering but I didn’t want anything too dense or thready to interfere with the cute doggie print. Wavy lines in the smallest strip and some swirls in the stripe and I was done! Time flies by so quickly these days that I was very happy to realize that I have 2 weeks here at home before I travel again … for some reason, I was thinking it was just one. Next up, more spool blocks, binding this Strippie, and deciding what gets loaded on the longarm next so I can find/piece a backing for it. How is it possible that time flies by so quickly?! 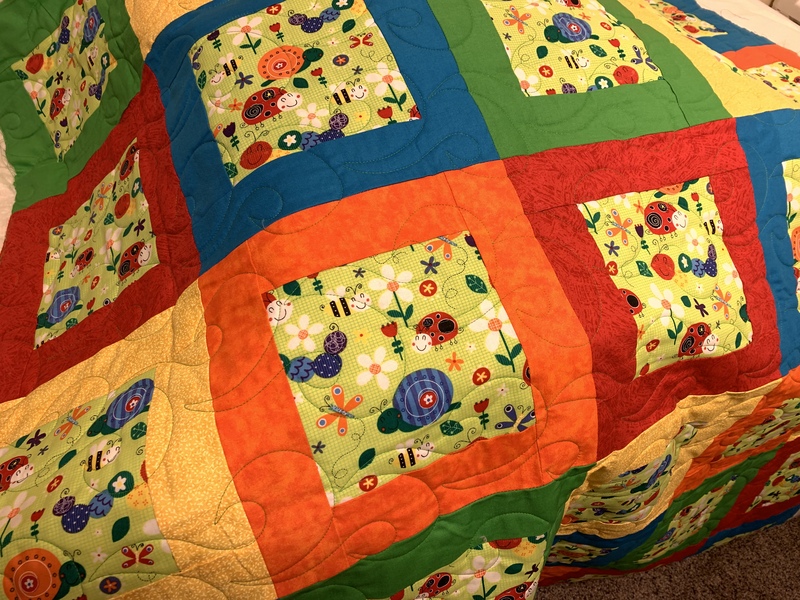 Mom pieced my Baskets quilt in Feb 2011 … yes, 8 years ago! 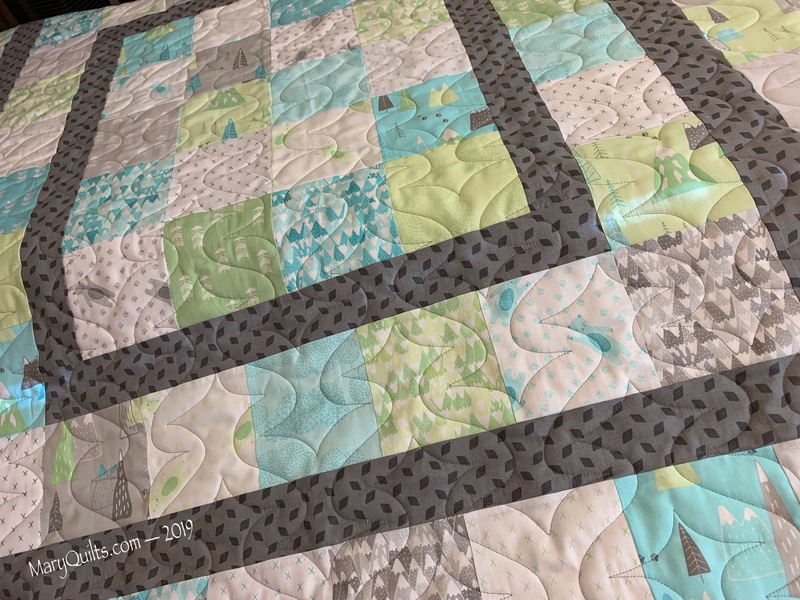 I had plans through the years for quilting it – first I thought I’d do some custom quilting with something special in the alternate blocks, then I thought I’d hand quilt it using the big stitch method … finally, I decided it was time to quilt and use it! 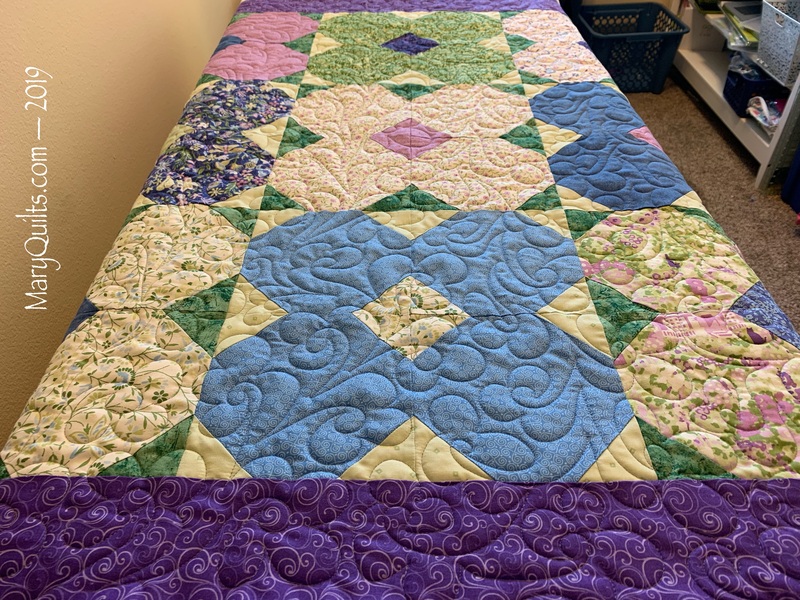 It got a plain old pantograph – Hearts in Bloom – and not only do I like the quilting on it but I’m thrilled to have finally quilted it!! I won’t get it bound until next week but it will be wonderful to finish up one of my oldest UFOs! 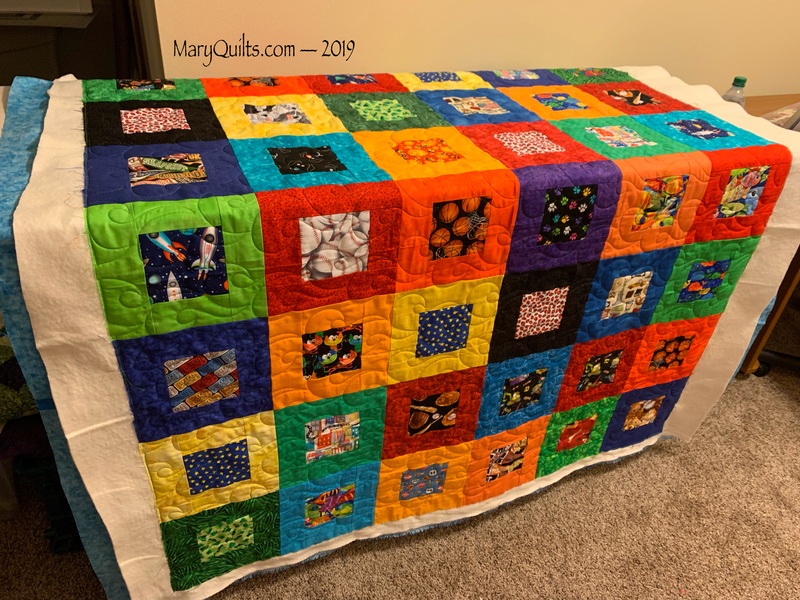 This was probably one of the first kits I purchased from Connecting Threads and Mom agreed to piece the top for me … for years, I’ve quilted for her and she has paid me back by piecing tops or stitching down appliqué blocks for me and we’re still helping each other. 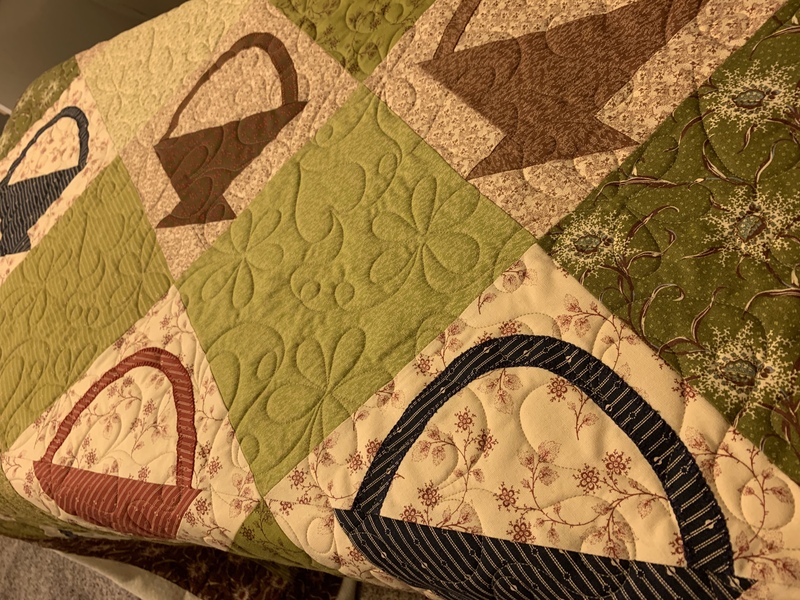 She appliquéd the butterflies in the quilt on my design wall and has already finished appliquing all my Heart blocks that she took home with her at the beginning of the month!